How does Islam and ISIS play a role in the Gog-Magog War? Vic Batista: We've been talking about a very important subject matter — the Gog and Magog War. Our hopes are that by learning how God is in control that we encourage people as let them know more about the end times that we are living in. You and I started talking about the Gog and Magog War in Ezekiel 38 & 39 and we've been taking a verse-by-verse approach to the chapters. We stopped at Ezekiel 38:17. I want to pick up with verse 18 and move forward. Nathan Jones: For a little background information, one of the most detailed end time wars described in the Bible, covering two complete chapters — Ezekiel 38 & 39 — is called the Gog and Magog War. The players are Israel on one side against the overwhelming armies comprised of nations that are led by Russia. Russia leads those 'Stan countries like Kazakhstan, as well as Turkey, Iran and Libya. All those nations are going to come against Israel with the desire to plunder Israel and destroy it. That is where we have gotten to so far. Let's pick up with Ezekiel 38:18-19. "And it will come to pass at the same time, when Gog comes against the land of Israel," says the Lord God, "that My fury will show in My face. For in My jealousy and in the fire of My wrath I have spoken. 'Surely in that day there shall be a great earthquake in the land of Israel, so that the fish of the sea, the birds of the heavens, the beasts of the field, all creeping things that creep on the earth, and all men who are on the face of the earth shall shake at My presence. The mountains shall be thrown down, the steep places shall fall, and every wall shall fall to the ground.'" Vic Batista: Wow! If that doesn't get people's attention, I don't know what will. Nathan Jones: Yes, and that scenario causes a lot of folks to wonder if we are going to be alive through all of this. That's a whole different topic right there, and we can look through the different time scenarios in a later segment. What this passage basically is saying is that that Gog will come against the land of Israel. God is the designated leader of Russia, we read in earlier verses. We don't know if Gog is his designation, or name, or a demon, but he's enticed to come down and form a coalition of nations, though not the nations directly surrounding Israel like Jordan, Syria, Lebanon, Gaza and Egypt. This coalition is an "outer ring" of Islamic nations. These nations also desire to gather to destroy Israel and plunder her. This is why the armies of Gog the Bible calls a horde, for they are so large and so massive that even the Israeli Defense Forces, one of the most powerful militaries in the world, cannot possibly stand up against the sheer numbers of troops that will be heading towards them. As the horde heads towards Israel, they are in truth being gathered against Israel by God Himself. God does this because of instead attacking the countries separately, He lets these combined nations come against Israel for the purpose of destroying them all at once. God plans to step back into human history with this battle. Sure, He's always been there and He's always sovereign, but by the end of this war, the whole world will know that there is a God of the universe and He protects Israel. Vic Batista: That's amazing! People today need to understand that there is a God. There are people out there who claim to be Atheists, or Agnostic, or whatever the case may be, yet we see evidence that God is all around, and yet people keep rejecting that evidence. But, a time will come when everyone will know that there is a God, right? Nathan Jones: Exactly. As a matter of fact, as we read through this chapter, we'll find out that is really the purpose for why God is gathering these nations. Sure, God wants to punish all those Islamic nations who call for the destruction of Israel every single day, and build nuclear weapons in order to destroy Israel, and attack them mercilessly both on the battlefield and in the UN. God is tired of that antagonistic condition. Another reason for this war is that God has given His promise to the Jewish people that He will restore them as nation after regathering them from around the world. We have seen this fulfilled in our lifetime. God will protect Israel. The Jews will believe in God by the time this war is finished, though not necessarily His Son, Jesus Christ. Later, by the end of a 7-year time period known as the Tribulation, that's when God will take a remnant of the Jewish people and bring them to believe in Jesus Christ as their Savior. Those saved Jews will then become a priestly nation serving Christ throughout His thousand year kingdom, called the millennial reign of Christ. So, we are getting to that point, but God has some things He needs to finish up here on earth in this age first. One of those matters is to deal with the intense hostility of the Islamic world against Israel. Now, I say the Islamic world because obviously Ezekiel 38 doesn't say the word Islam. Ezekiel 38 was written by the prophet Ezekiel some 600-700 years before Jesus' first coming. Islam didn't come about until near 600 AD, so we are looking at about 1,200 plus years before Islam was on the scene. Russia, Iran, Turkey, Libya, and Sudan and those other listed nations have never in the history of the world been joined together like this alliance. What unites them is both Islam's hatred of Israel and Russia's desire for national wealth. We are seeing that today. Those alliances exist today! I believe the Gog and Magog war will be a judgment against Islam for its constant desire to destroy Israel. Vic Batista: That's a very good point. People don't understand what Islam is really about. Hal Lindsey and some others have been sounding the trumpet for many years that Islam is not a peaceful religion. I guess people must just listen to parts of the news to gain their views that it is somehow peaceful and ignore the daily slaughterings. Nathan Jones: Anyone who thinks that Islam is a religion of peace has their head in the sand. I have studied it extensively and read many books and I even teach on it. I have a sermon called "The Fall of Islam" on our website at lamblion.com. Islam's founding belief is that God, whom they call Allah, is totally distant. You cannot be assured of salvation. It is a very works-based salvation. The only way to guarantee you going to Paradise in Islam is the destruction of the infidels, particularly the Jew and the people of the Book, IE the Christians. That is why we see so much hostility from Islam against Jews and Christian,s because the only way they can be assured of going to Heaven is to die a martyr in the cause of destroying Israel and the Christians. Islam is not a religion of peace. It is a religion of death. It is very satanic in origin. I don't have any qualms in saying that. I know that isn't PC whatsoever to say, but it is what it is. Until the world wakes us and realizes that the mission of Islam is to destroy Christianity and destroy Judaism and take over the world, then our nations are going to be weak and fall against their onslaught. I believe Islam will not take over the world, because Ezekiel 38 & 39 will happen. Bible prophecy always is fulfilled 100% of the time, so at some point, and I believe soon, God will deal with the Islamic problem on this planet. Vic Batista: Absolutely! That is why the world has the issues with ISIS. 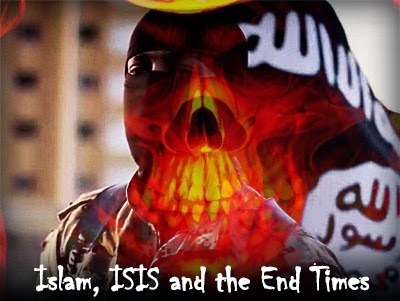 One of the questions that came up this week concerned if ISIS is in Bible prophecy. Your thoughts on that? Nathan Jones: ISIS is an Islamic terrorist group that is so radical that even Al-Qaida, which has been the number one terrorist group that the West has been fighting for some 14 years now, has terrified everybody globally. They desire to rebuild a caliphate, in other words, an Islamic empire across the planet. ISIS initially poured out of Syria and then went into Iraq. Once the U.S. army pulled out of Iraq, the nation became very weak. The Iraqi troops just couldn't handle the ISIS invasion. ISIS has taken over much of Iraq. Their desire is to conquer not only Syria and Iraq, but then go down through Jordan. They've got groups in the Sinai Peninsula in Egypt utilizing smaller terrorist organizations that have now proclaimed that they are going to fall under the ISIS banner. The ultimate desire of ISIS, and they've made it public, the main religious leader of this group who calls himself al-Baghdadi has proclaimed their desire to conquer Israel. Islam wants to conquer Israel because they believe that it is affront to Allah for Islam to lose any Muslim lands. For many centuries Islam dominated the land that was called Palestine. When the British took it in WWI, and then Israel afterwards became a nation, Muslims saw the loss as an affront to Allah. They won't rest until 100% of the land of Israel is back under Islamic control. So, do you think that there can be a peace process through that view? Vic Batista: This is very eye opening. People really need to understand that part of this hatred of Israel is all part of Bible prophecy being fulfilled. All the nations' ultimate purpose will be to come and try to destroy God's people, but for now, the Gog and Magog War only deals with Russia and this Islamic ring of nation. That's exactly what Ezekiel 38-39 is showing us here. Possibly ISIS will play a role in this war, and possibly it won't. It could unify the Middle East by conquering it, or it could be setting the stage for Ezekiel's prophecy. We will have to watch and see what comes of them. In the eleventh segment of our study of the Gog & Magog War of Ezekiel 38-39, Vic and I will discuss the incredible earthquake that will shake the world during this battle.